The tables are turned...here we go! Q: Being a part of someone’s collective family, work related or not, often involves tasks that are out of the ordinary. And being such a close part of Duran’s family, you are sure to have gotten some great ones. What is the strangest thing that each of the guys has ever asked you to help them with or do? KK: And I would totally lose my job if I told you that! Honestly, the tasks are never terrible, and for the most part, they are so self-sufficient. Q: What is the quality you most admire in each of the band members? Q: What is the coolest thing the band or someone in the band has ever done for you? KK: I wouldn't even know where to start! I've had so many amazing experiences because of this band. I guess one of the coolest (and earliest) ones was when I first started working with the band, and went to England on vacation. My friend asked me before I left if I was going to call the band members when I was there. I was a bit shy about it, to be honest, since I hardly knew them well and thought they wouldn't want to see me. To illustrate how long ago it was, once there I plucked up the courage to I call Simon from a pay phone (!). To my surprise, he said he would come by the next day at Noon to see me. The next day in walks Simon thru the Lobby of my hotel holding on to two motorcycle helmets. Everyone in the Lobby was staring at me as he put the helmet on me and secured the chin-strap. I may have looked like any idiot but I felt like a rock star! Q: What are some of your favorite memories involving the band? 1) When they won the Lifetime Achievement Award at the MTV VMAs. I was so proud I cried, even if MTV messed up the video montage. Q: What are the most important things that working with Duran Duran has taught you? KK: I think I learned never to take your position in life for granted. I’ve worked with many artists, and Simon, Nick, John and Roger consistently treat the people around them with kindness and respect. Being famous is not a license to treat people poorly, but unfortunately, that is often the case. I’ve never seen any one in the band be outright rude or condescending to anyone. They are not only genuinely nice people, but I think they know how lucky they are to do this for a living and are very thankful for it. Q: You are essential to the fans. Do you ever feel pressure being a direct resource and contact for them? KK: Sometimes, yes, I do, but that motivates me more to do the best job I can. It can be very “flavor of the month” to some extent. If I answer a question, I am very well liked, if I am unable to respond or reply in a way that is suitable to the person who sent the email, then I am not so well liked. I understand, and it goes with the territory. I only wish I had as much “pull” as fans think I do! Q: How many fan emails on average do you get weekly from fans? KK: It is very dependant on how busy the band is. If they are touring, or it’s surrounding an album release, I get 100s. During a period of inactivity, if the band is in the Studio or something, it dips down to 40 or 50 a week. Q: What is the most difficult question you have ever been asked? KK: The difficult ones are always the ones when someone is suffering from a hardship, be it illness, financial loss, a death in the family, etc.. The people who write to “Ask Katy” and express the painful time they are experiencing feel a connection to the band and it’s important for them to maintain that. There are some people I am able to cheer up and help, and then there are others that I am not, and that always makes me sad. Q: What is the funniest? Q: What is one of the band’s favorite ‘Ask Katy’ questions of all time? KK: I think they each have their own personal favorites, but a good one was a few years back was when a fan provided “styling tips” to the band members that were (unintentionally) hilarious. I’ve also gotten a surprising number of questions asking if I have my job from sleeping with a band member. I always think, if I HAD done that, would I be “relegated” to answering the band’s emails? Q: Whose idea was it to publish a book of ‘Ask Katy’? KK: It was Nick’s and mine idea initially, but the rest of the band was very much in to it. We were reminiscing how we couldn’t believe it had been 10 years since we launched the site and “Ask Katy” came in to existence and the book was born from that conversation. Q: How did you decide what made it to the book? KK: That was not easy. We had over ten years worth of questions to cull from. The book has gone through many revisions and unfortunately we had to lose some great questions for lack of space – so perhaps there is an “Ask Katy Part 2” in there somewhere! 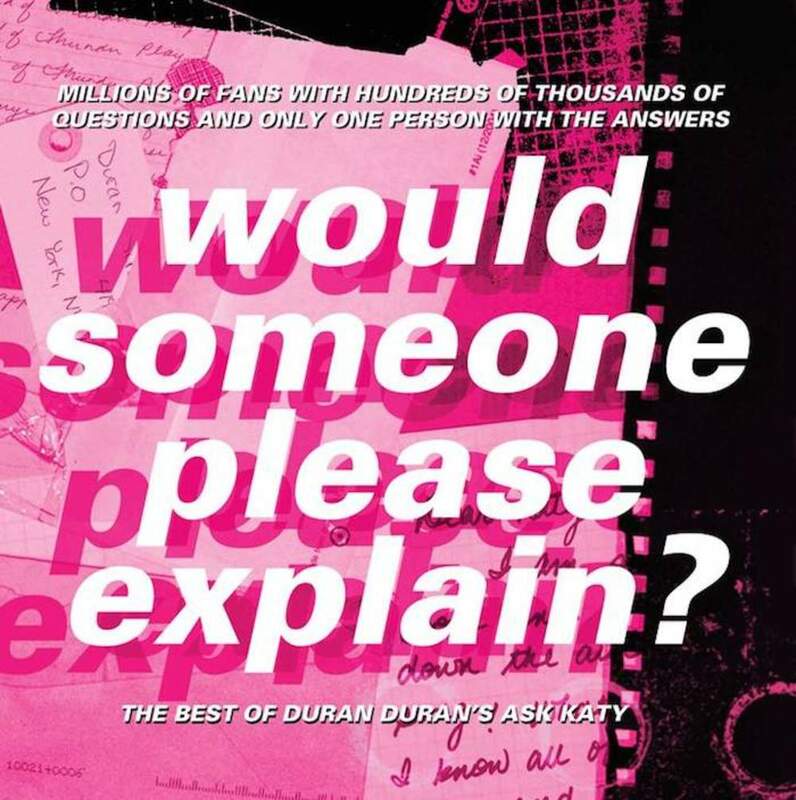 We really wanted the book to share the essence of what “Ask Katy” is about – the unique relationship the members of Duran Duran have with their very active, and supportive, fan base.